No-Shows are expensive. 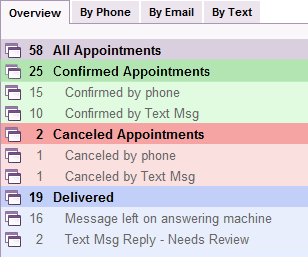 Reduce your no-shows with automated appointment reminders. Deliver telephone, text, and email reminders easily and affordably. Nothing hardware or software to buy. 60-Day free trial. Never a contract. Scalable from sole practitioner to nationwide enterprises, Tavoca gives you the best combination of high-quality, fully-customized professional reminders with per-patient pricing as low as 5¢. Phone, Text, and Email messages include interactive response options. Keep up-to-date with Tavoca news. View your messaging results 24/7 with our easy-to-use online reports. Drill down is quick and displays all the details about message delivery and results. No hardware or reminder software purchase is required when using automated appointment reminders and messaging service by Tavoca. There is nothing to install locally. Using a simple data transfer from your scheduler or our free online entry option, your messaging will produce immediate and measurable results. All messages are fully customized and professionally recorded. Our efficient and easy-to-use reminders require about two minutes per day for most of our clients. 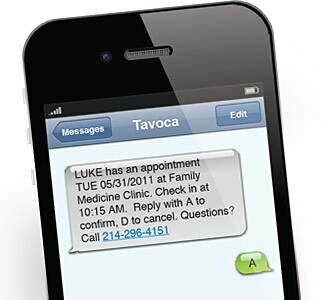 Tavoca is a leading provider of appointment reminders and appointment confirmation service on the market today. Our automated appointment reminder software-as-a-service enables our customers to efficiently and affordably remind patients about appointments, follow up no-shows, notify patients about annual exams and deliver other patient messages. Our automated appointment reminders, powered by our proprietary automated appointment reminder software, will give your business access to the most efficient and cost effective appointment reminder service available. Our services are scalable from single-provider to nationwide enterprise solutions with pricing as low as 5¢ per appointment. We interface with practically every scheduling package on the market. And many of our data interfaces include automatic data transfer. With appointment reminders increasingly becoming an expectation of modern life, more and more companies are turning to appointment confirmation and reminder services as a necessary means of communicating with customers and patients. It is our mission to be a leader in appointment reminder technology and appointment reminder services with best-in-class affordability. Call us today at 800-962-4214 and speak with one of our experts regarding our state-of-the-art automated appointment reminders and other automated messaging services. We offer a 60-day free trial to all new customers. And we never require a contract.